Coming in an array of variations, when used for introducing accents, purple offers a way to add touches of elegance and sophistication. Beyond doubt, purple is a color with a royal and exotic flair, usually associated with luxury, creativity, dignity, spirituality, and magic. Unquestionably, it is a beautiful color, which, depending on the used tint, shade, or tone, helps create either dramatic interiors or soft, serene ones. A combination of blue and red, purple ranges from Mauve and Orchid to Mulberry and Byzantium to Pansy purple. Whether used on the walls, as furnishings, or for accessorizing a space, purple offers an option to add style, richness, depth, visual interest, as well as touches of mystery and luxury and create exquisite, classy interiors. Furthermore, it works well with an array of other colors, such as black, white, silver, dark gray, soft blue, yellow, and lime green. Generally, whatever the purple variation, when strategically positioned, purple accents can brighten up and take any bedroom to the next level. With a number of variations to choose from, purple is a perfect option for creating accent walls. Whether a single tint or a combination of different shades and tones is used or purple is paired with other colors, it is a popular choice, which usually makes stunning accents. For smaller spaces, opt for lighter, subtle tints of purple, such as lavender because they create a sense of brightness. Furthermore, paler shades lend a space a soft, feminine look. In larger spaces, intense shades of purple tend to add touches of drama and sophistication and usually give the bedroom a masculine vibe. For a balanced, harmonious look, accents in darker shades are usually paired either with light or neutral hues. Generally, whatever the variation, when done right, purple accents definitely make a statement and help create alluring, striking interiors with tons of charm and personality. Paint and wallpaper are common, affordable ways to introduce accent walls. Note that wallpaper is always an option to add some extra pattern, texture, and touches of drama to any space. In this light-filled bedroom, different shades of purple create a sense of elegance and sophistication. Mauve paired with white for the walls complemented with plum bedding, upholstery, and throw pillows is unquestionably a stunning combo. An ornate mirror and a floral rug add visual interest. DIY projects are easy, budget-friendly options to transform any space and lend it a fresh, completely new look. Above, a DIY two-shade accent wall adds artistic touches to this adorable bedroom. Furnishing and accessories bring texture, pattern, extra color, and visual interest. In the picture above, white-trimmed lavender walls help create a soothing atmosphere in this cottage-style bedroom. Lime green and pink/used for the furnishings and accessories/work well with lavender to make this space feel cozy, charming, and inviting. An area rug adds organic touches. Although some people find it overwhelming, beyond doubt, purple is a striking color to decorate with. If you love the mysterious touches it adds yet not willing to use purple for wall accents, then, try with purple furnishings, larger or smaller ones. Anything from beds, nightstands, headboards, and area rugs to floor and table lamps to seating options and curtains can do the job. Choose a variation of purple you love the most to introduce a large piece of furniture or a group of smaller furnishings to definitely create a unique, spectacular space with statement accents. Another décor option to use is applying softer tints of purple on the walls complemented by furnishings in darker tones of the color. This approach helps instantly create focal points and add personality to any space. In the picture above, an adorable bedroom. A purple velvet bed immediately grabs the eye. Matching nightstands, table lamps, and Roman shades create a sense of harmony and balance. Chevron throw pillows in red, purple, and white and a chevron area rug add texture, visual interest, and extra color. Above shown, an elegant guest bedroom with a layered look. 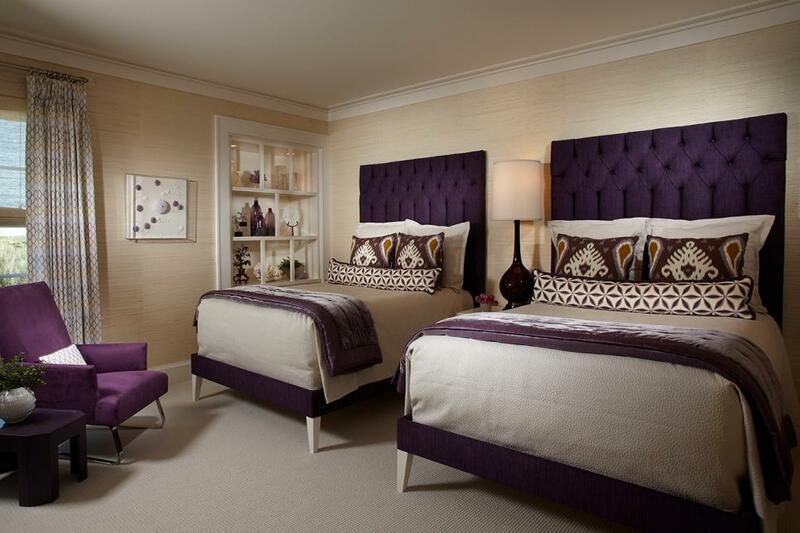 Matching purple beds with stunning tufted headboards that offer functionality and add touches of luxury and sophistication stand out against the background of grasscloth wallpaper walls. A purple armchair provides seating. A stylish display and a piece of wall art bring visual interest and artistic touches. Truly impressive! Above, a master bedroom with a soothing atmosphere. A richly skirted bed with a unique wrought iron headboard offers coziness. Curtains, throw pillows, and a throw in soft, pale shades of purple add color, texture, and visual interest to this neutral space. A stunning chandelier brings touches of luxury and sophistication. Flowers bring freshness. What an elegant, subtle way to add purple accents to a bedroom! In the picture above, an eclectic guest bedroom. A colorful patterned headboard with a unique shape pops against the crisp white bedding. A richly decorated purple folding screen makes an enchanting focal point. A skirted nightstand and a throw add some more purple. A magnificent carved chair brings extra visual interest and a lot of character. Definitely, a bold, dramatic, magical space! However, if you truly love purple but feel somehow intimidated by its power, introduce it in small doses. Stylish, tastefully used accessories offer a way to include some purple accents in any bedroom. Although throw pillows are the most common and easiest solution, anything from wall art to bedding to scented candles, trays, vases, and flowers can do the job. 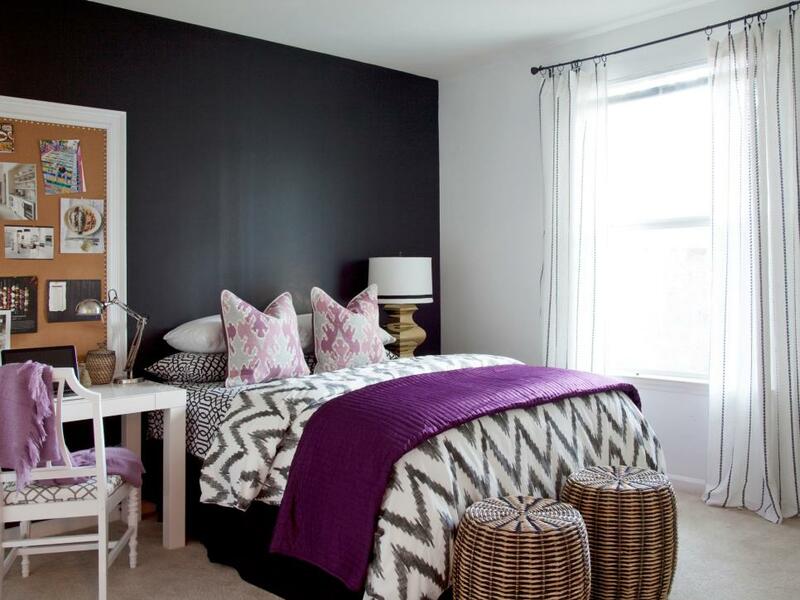 Above shown is a bedroom in black, gray, and white with a bold, modern, textural look. A pair of matching stools creates a sense of harmony. Tastefully chosen purple accessories work well to add touches of sophistication and take this space to the next level. In the picture above, a fascinating master bedroom with an organic vibe. Matching nightstands and table lamps create a sense of harmony and balance. A mesmerizing piece of modern wall art stands out against the background of the white walls and adds bold, artistic touches and visual interest to the space. 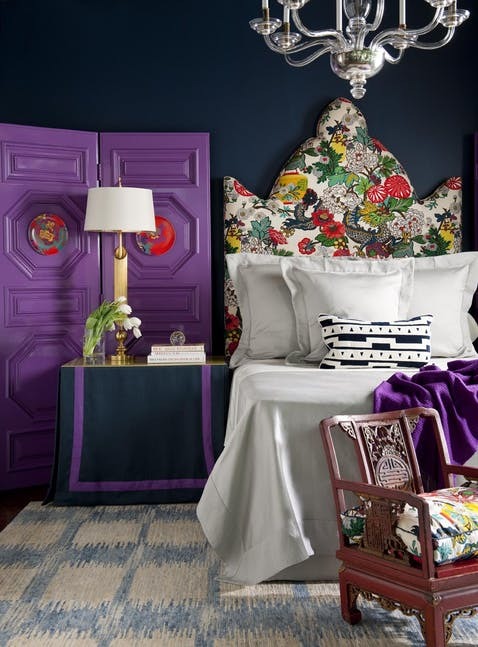 Throw pillows repeat the colors of the painting and bring some extra purple in this bedroom. Unquestionably, when tastefully introduced, purple is a stunning color for making accents, from accent walls to eye-grabbing furnishings to stylish accessories, you definitely can’t go wrong with purple. Note that due to the range of its variations, purple can be incorporated equally well in master and guest bedrooms, child and teenage spaces, and nurseries. Although some might find this color overwhelming, it makes captivating focal points and helps create sophisticated, elegant, fascinating interiors. In addition, purple works well with an array of other colors, such as black, white, gray, silver, and more, as well as with natural wood. Depending on the shade, tint, and tone, it comes in an array of variations, which offers the opportunity to lend your bedroom the look you like most, from a refined yet dramatic space to one with a soothing atmosphere and a homely feel. Furthermore, the use of different shades of purple adds depth and gives the bedroom a layered and textural look. Do you actually like to decorate with the color purple?